Coming to Cleland Ice Rink as a visitor is a two part process. Make your way to Cleland. After you have reviewed the information below in its entirety, visit the Facilities page for information on our rink and its address. Cleland Ice Rink is located on Fort Bragg in Fayetteville, NC. Fort Bragg is known as the "Home of the Airborne and Special Operations Forces” and is the home for the XVIII Airborne Corps; the 82nd Airborne Division; the US Army Special Operations Command and the US Army Parachute Team (The Golden Knights). In addition to these fine units, Fort Bragg is home to the Cape Fear Warriors! 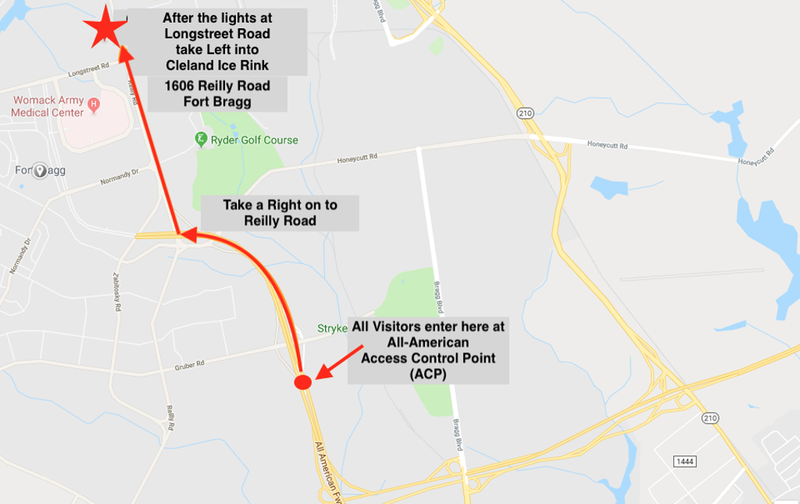 All visitors should gain access to Fort Bragg through the All-American Access Control Point. See map below. Raising your vehicle hood and opening all doors; in addition, to any glove boxes/consoles. Standing at the designated area while the vehicle is inspected. Providing documents from above again. For more information find Fort Bragg's detailed registration instructions here or contact the All-American ACP at the phone number listed below.